In the last two years since Supertyphoon Yolanda hit Leyte and its neighboring areas, Yedda Romualdez has been performing her civic duty as the wife of Leyte (1st District) Rep. Martin Romualdez and as a concerned citizen of the district. In these photos, we see her turning over loans (in cooperation with Invictus Microfinance, Inc. and the international non-profit relief organization IEDA Relief) to residents of Tacloban and Alang-Alang, Leyte for their respective livelihood programs, as well as spending time with Leyte’s barangay officials (in Manila as part of their Lakbay Aral program, and in Cebu as part of the Orientation on Community-Based Disaster Risk Reduction Management). 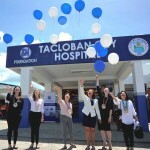 She was also present at the turnover ceremony of the rehabilitated Tacloban City Hospital by the SM Foundation.